Bindo's Device Mangement and Store Whitelist feature allows you to control which devices can access your Bindo store(s). For each store that you manage in Bindo you may define an approved list ("whitelist") of devices. To turn on this feature log onto the Bindo Dashboard ( https://dashboard.bindo.com) and click on the "Event & Devices" link on the left hand side menu. Note that you must either be a Manager or have proper permission settings to access this page. On the Event & Devices page you will see a map with various pins. Each pin represents a device that has accessed your Bindo store. The pins represent every device that has ever had access to your Bindo store. 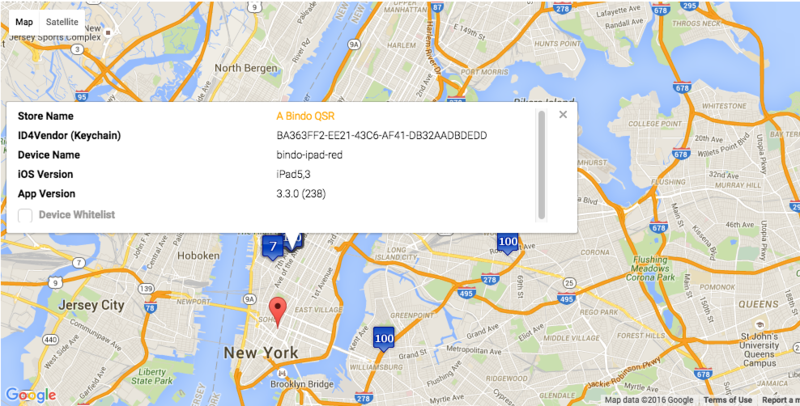 Click on a specific pin to see device information including the Store Name, ID4Vendor (a unique device identifier), Device Name, iOS Version, and Bindo App Version. By default the Store/Device Whitelist feature is disabled. To turn on this feature and restrict access to your store scroll down and click on the "Store Whitelist Enabled" checkbox. When Store Whitelist is enabled you will only be able to use Bindo on devices that are authorized on the device list. If no devices are checked you will not be able to access Bindo on your iPad. To select specific devices select the "Whitelist" checkbox next to each device which should have access to the store. Devices that are not checked will be restricted from accessing this store. To turn off the feature simply uncheck the "Store Whitelist Enabled" box. The device whitelist must be set up individually per store. Note: You may see devices on the list that you do not recognize which may represent Bindo support staff devices. If you are unsure of whether to grant a device access to your store please contact Bindo Support at support@bindo.com to discuss best practices for the Device Whitelist.